The WaveJet 300A oscilloscopes family includes 2 and 4 channel models operating in the 100MHz, 200MHz, 350MHz and 500MHz bandwidths. 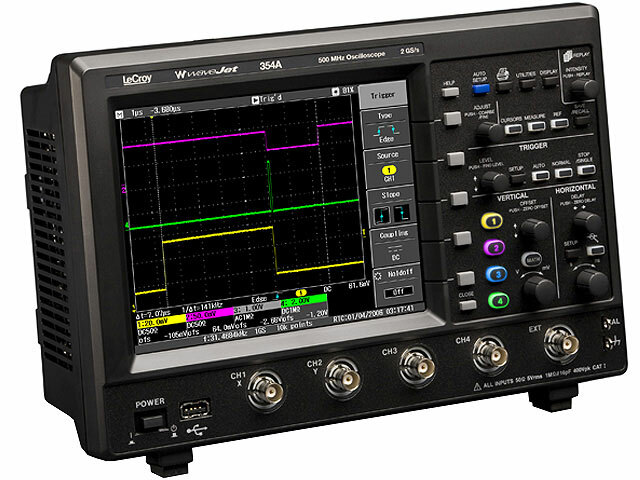 These oscilloscopes are characterized with a big, bright LCD display with the resolution of 640 x 480 pixels (VGA). The sampling frequency is 2GS/s (1GS/s for all channels and 100GS/s in the equivalent mode). Ergonomically located press-buttons and control knobs as well as intuitive menu enable very easy operation. Oscilloscopes are ready for operation after only a few seconds from switching on. A characteristic parameter of the whole WaveJet series family is the length of the capture time, which is 500kpts. Such capture time helps to observe signals with low and high frequency and signals with fast edge rising and falling time. 26 automatic measurements enable quick signal analysis. The Replay Mode allows shifting back the process, isolating anomalies in the signal and their analysis. Thanks to this feature, we have the possibility of fast detection of a problem source. The oscilloscopes have cursors, mathematical functions with FFT analysis and an independent frequency meter. As a standard, the WaveJet family is equipped with two USB ports. Those ports enable communication with a PC, connection of additional memory or a printer. Ethernet and GPIB interfaces are available as optional equipment.